Video eye | Visionary Eyecare's Blog: "The Eye Journal"
This is a good video from Optifree that gives instructions on Contact Lens insertion, removal, proper cleaning and other instructions and tips for successful contact lens wear. ALWAYS wash, rinse and dry your hands thoroughly each time you handle your contact lenses. This will help eliminate germs (bacteria, viruses, fungus etc) that can cause eye infections and vision loss. Clean, Rinse and Disinfect your contact lenses after wearing them. Make sure that you DO rub your contact lenses (even if the solution says “No Rub”) – this will help in loosening any deposits, films or debris on your lenses. Saline solutions are used to RINSE contact lenses (NOT to clean or store contacts) – use multipurpose solutions for cleaning and storing contacts. Remove your lenses IMMEDIATELY if they become uncomfortable or your eyes become red and/or light sensitive. Discomfort and irritation can be an early warning sign of a problem. If discomfort continues AFTER you remove your contact lenses – IMMEDIATELY contact your eye doctor. DO NOT INSERT A CONTACT LENS INTO AN EYE THAT IS RED, IRRITATED, PAINFUL OR UNCOMFORTABLE!! Do NOT sleep in your contact lenses. People who sleep in their contact lenses have a higher risk of eye infections and ulcerations. DISCARD your contact lenses as directed by your eye doctor (daily, weekly, bi-weekly, monthly etc). 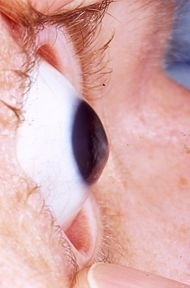 Wearing a contact lens longer than the approved wear time can cause infections and corneal distortions (the front of the eye can become warped with contact lens overwear). Do NOT swim, shower or bathe in your contacts. Tap water and pools can have organisms in them that can cause infections an even PERMENANT vision loss. Have YEARLY Contact Lens Eye Examinations. Your eye doctor can re-evaluate and re-fit (if needed) your contact lenses for you every 12 months. Sometimes contact lenses feel comfortable even if they are causing problems. Your eye doctor will evaluate if the prescription needs to be changed to get you the most precise vision and they will also evaluate if the contact lens that you are wearing is causing problems that you may be unaware of. CLICK HERE for more information about Contact Lenses from Visionary Eyecare’s website.